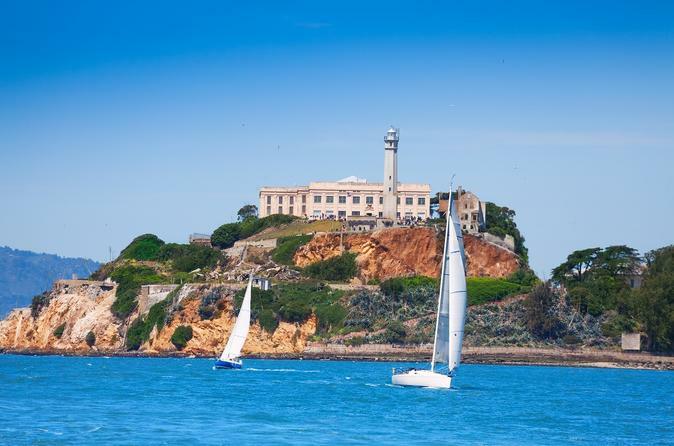 This full-day, small-group San Francisco city tour explores all the top attractions of the city, including Alcatraz Island prison. Explore Chinatown, the Fisherman's Wharf, the Golden Gate Bridge and many other attractions accompanied by your knowledgeable guide. This tour includes hotel pickup and drop-off for most San Francisco hotels. On this tour, your “city insider” guide knows where to take you so you get the most from your visit to San Francisco. Don't just sit on the dock of the bay—see all of San Francisco’s attractions like The Embarcadero, Fisherman’s Wharf, Pier 39, Coit Tower, the Financial District, the Palace of Fine Arts, Chinatown, Nob Hill, the Castro, the Mission districts, and the not-to-be-missed Golden Gate Bridge. Make sure you have enough memory for all those selfies! You'll be dropped off at Pier 33 for the Alcatraz portion of your tour, where you will board a ferry to Alcatraz Island. Your Alcatraz Tour begins with a 45 minute audio presentation "Doing Time: The Alcatraz Cellhouse Tour," featuring recordings of actual guards and inmates who lived and worked on the Island. Once your Alcatraz Audio Tour is finished, explore Alcatraz Island as long want on your own, but don’t forget that you have to get the ferry back to San Francisco! To complete this San Francisco city tour, you’ll head out to explore the city’s majestic parks, rugged coastline and diverse neighborhoods. Enjoy historic Presidio. Pause to enjoy cliff-side views of “city by the bay”. Be blown away by the beauty of Golden Gate Park. What made the Haight-Ashbury, Mission and Castro districts what they are today? Learn the stories. Laugh out loud at the surprising, sometimes crazy, things that have made San Francisco one of the world’s most beloved cities. Snap some pictures of the Jimi Hendrix Red House—and the legendary pad of The Grateful Dead.